Following on from Christoph Janz’s excellent insights in The evolution of the SaaS landing page (the 1999 screenshot of Salesforce.com alone makes it worth a read!) we thought it was about time to dig deep into the landing pages of top SaaS companies, and look at the common elements that make them what they are. THERE’S A NEW VERSION OF THIS ARTICLE! We’ve published a new 2017 analysis of SaaS landing pages — This year we’ve expanded to over 100 companies — it’s packed with more insights than we’ve ever published in one article. For this analysis, we scoured over 40 landing pages across the web. It’s clear that web design standards and best practices, as well as advanced optimization techniques, are leading to conformity of most standard elements. However, business websites still need a way to stand out, and to market the product in new and inventive ways to the user. Follow Ed’s board Top SaaS Landing Pages on Pinterest. How prominent does it need to be? Users should be able to find it when they want it, but making it the most stand-out part of the page may draw their attention away from actually reading your content. Simplicity is king! An overly-complex site navigation will leave your visitors confused like a tourist in a city without a map. Does it always need to be visible? Consider hiding it at points when the user will be browsing your page content. SendGrid offers a fairly standard site navigation – but notice how they split out the “Core” items from other functions such as their blog, or support links. 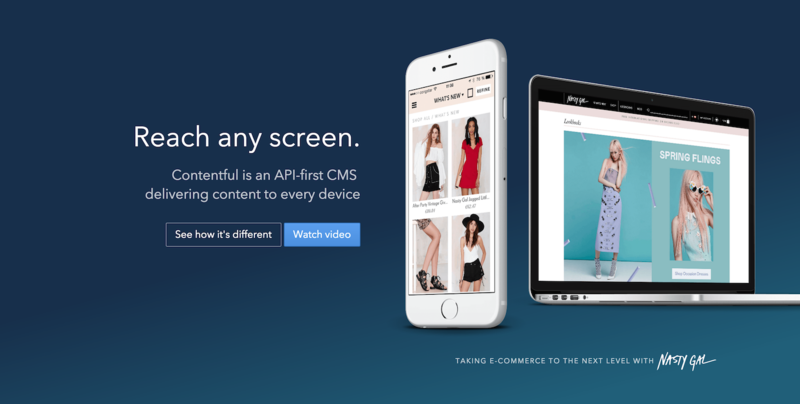 Vend also splits out primary navigation from other parts of their site. Also, notably, they stick to 3 main navigation items and hide the remaining items behind a “more” dropdown, to reduce noise and complexity in their menu. Scrolling vs. Clicking. Scrolling is perfectly natural – usually more-so than clicking through menus. And it requires fewer page loads. As highlighted in the examples above, keep your navigation clean if necessary by hiding secondary items. Remember that existing customers will land on your homepage too – don’t make it difficult for them to log in to your app! This is the single image (or video) that grabs the attention of your user, and entices them to read more about your product. 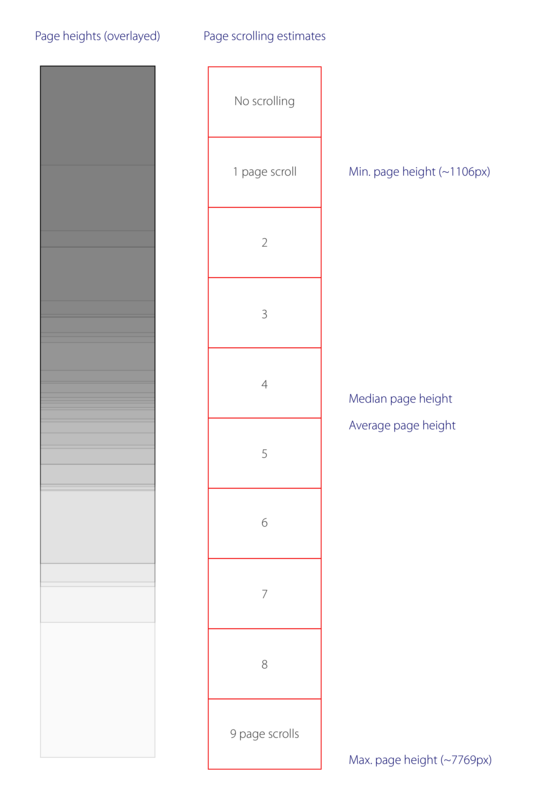 Quite often this will be a full-width large image, that takes up most of the visible screen. The hero shot has emerged as the leading element of landing pages in recent years, with high speed internet allowing for large, high-resolution images showcasing the product in a much better way than words ever could. Google, as always, employs the very clean look that they defined years ago for their Search product. The use of people in their hero image brings a human element to what could otherwise be perceived as an unfriendly, corporate product. You don’t have many seconds to capture the attention of a visitor. It’s got to be visually striking or highly appealing to succeed. Full-page video is just about feasible, given today’s standards for high-speed internet and powerful browsers. If your product is not very visual, why not leverage what your customers do with the product? The USP is your unique selling proposition. It describes in the most concise way possible what your product is about – and persuades your visitor to continue browsing. Huddle’s USP does a great job at conveying what the product offers to its customers, in a clear and concise way. Intercom is all about communication, and simplicity. Their USP summarizes all of the core features of the product. Most companies use a one-liner, followed by a subtitle of 1-2 sentences. If you can’t get to a simple one-liner, think on a higher level about what your product solves. The Intercom USP above is a great example of this. Avoid using elaborate adjectives or adverbs here. This is not the sentence that sells your product, it’s simply to pique the interest of the visitor. Geckoboard very clearly sells benefits, rather than features. Benefits like “Make better decisions” are far more compelling than software features. Dropbox offers a compelling set of benefits for using their product, that clearly show how the user’s everyday life is considerably better with an account. Show benefits not features (mentioned above). There is a place for feature lists on your site, especially with more enterprise-focused products (those customers will often evaluate your product with their own list of features that they require) but that’s not for your landing page – try the Pricing page. Icons can nicely compliment the features you list here, and give an even quicker impression of the benefits you’re offering to customers (see the Geckoboard example above). Descriptions should still be kept brief, but linking through to a product page for a more detailed overview of the features can also be helpful. 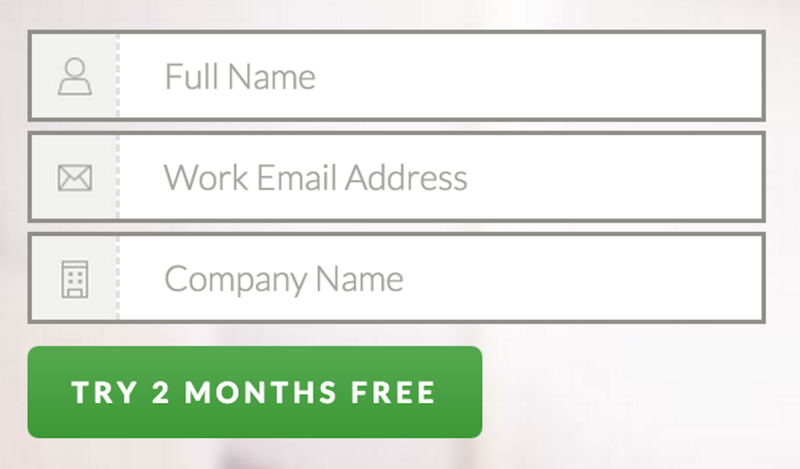 This can include a signup form, or simply a button, and is the primary goal of the landing page. A key goal here is to have a single call to action on the page. Multiple CTAs make it less clear for the visitor and risk clouding the powerful message you’re conveying. Multiple options = lower conversion. Freshbooks displays a simple, clear CTA. Notice how explicitly it describes what the user is doing in clicking the button – they are getting a free trial for 30 days. This reduces any uncertainty. Higher confidence = higher click rate. Zenpayroll includes a short form in their CTA. This means that they can shorten the signup flow, and get the user registered and using the software much more quickly, decreasing the chance of drop-off somewhere in the signup journey. Be explicit with the copy. Make sure that a visitor knows what they’re doing when they click the button, to reduce the rate of “accidental” clicks. 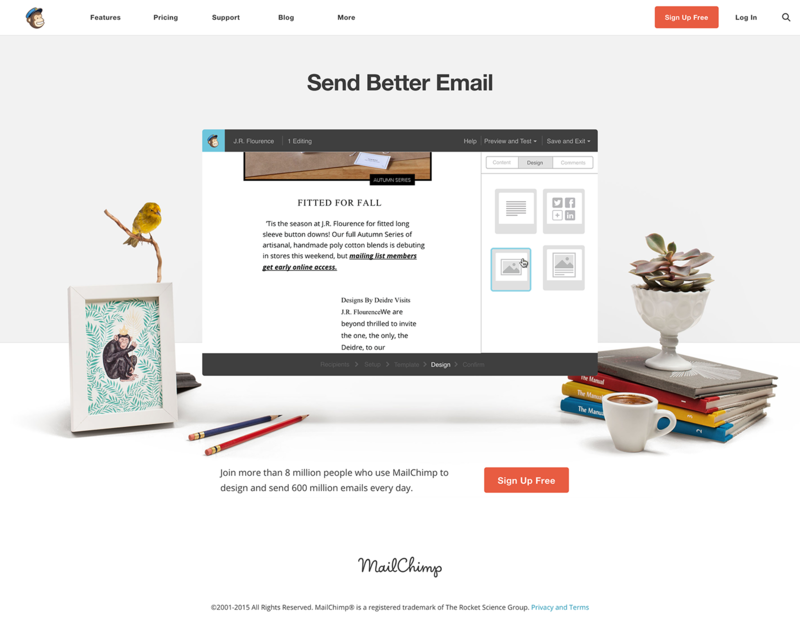 You want users to click with full intention. Put it where the user expects. Unbounce have written many great guides on this, as well as other CTA optimization tips. For example, using “my” instead of “your” (i.e. “Start my free trial”) converted 90% higher for them! 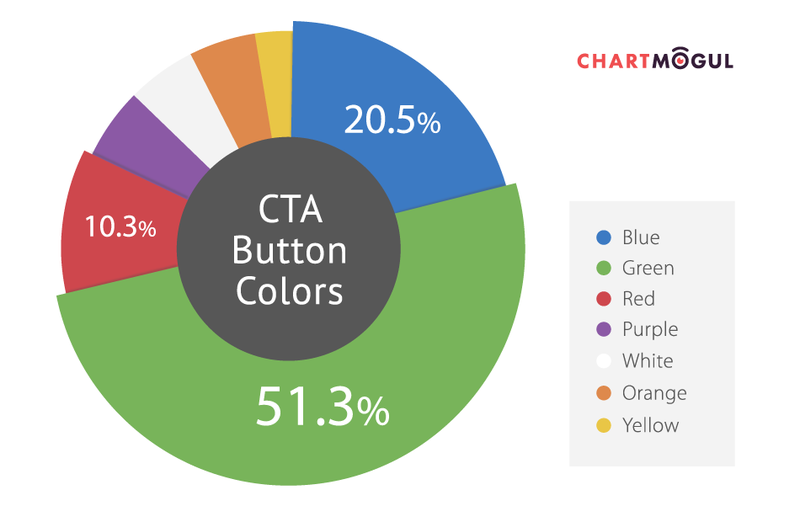 The vast majority of CTA buttons in the landing pages we looked at are green. This is really important in giving the visitor that extra piece of confidence required for them to vote with their mouse pointer and sign up to your service. There’s no more powerful persuasion tool than personal recommendation, from real people. If visitors can see that others are successfully using your product, they’re much more likely to come onboard themselves. 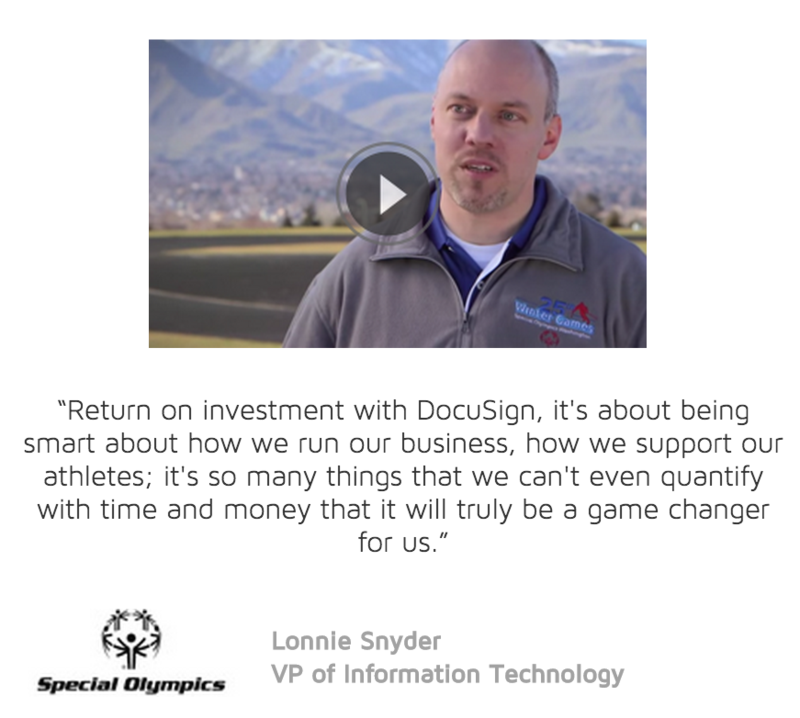 Docusign goes the extra mile with the social proof on their site, by including video content to accompany the testimonial. Video is far more engaging for users than text content, and seeing real people discuss the product would likely have a big impact on the confidence of the user when it comes to buying the product. At ChartMogul, we wanted to really leverage the positive feedback for the product we were receiving in social media, so we built a scrolling carousel of real tweets. This truly reinforces that real people are getting real value from the product. Showing real people, with real profiles has become key in a world where some companies actually create false social proof. Placing social proof at the point on the page where the user is making a decision about purchasing (or registering) is a good tactic in giving them that last reassurance they need to commit. Link your social proof to larger case studies or video. This will further boost users’ confidence in the product. As always, simplicity is king. The challenge with so many enterprise business websites is in distilling down what are hugely complex products and solutions into something that the user can interpret and evaluate in just a few seconds. Attention Ratio is a representation of how many links the user has the option to click on your landing page vs. the primary conversion goal (i.e. a trial sign-up). Whilst you’re never going to achieve the holy grail of a 1:1 ratio on your main company landing page, you should remember that every link the user can click other than the signup CTA is giving them a “way out” of converting. Read about the concept of Attention Ratio on the Unbounce blog – and then take a look at your landing page. What’s the attention ratio there? We’re testing a background video variant of the ChartMogul landing page, but it’s too early yet to pull any meaningful results.